Aside from Capitol Hill, GOP Also Built Big Clout in State Capitals Across U.S.
As tempting as it is to focus only on what the Republicans accomplished in the midterm elections in Congress – taking control of the House of Representatives, and adding at least six Senate seats, it’s just as important to look at GOP victories in statehouses across the country. Some would argue even more so, given the role that governors and state legislatures play in policymaking and critical redistricting decisions. With three states still undecided, Illinois, Minnesota and Oregon, the Republicans so far have picked up 11 new governorships – in Iowa, Kansas, Maine, Michigan, New Mexico, Ohio, Oklahoma, Pennsylvania, Tennessee, Wisconsin and Wyoming. Separately, they lost four to Democrats in California, Connecticut, Hawaii and Vermont. And they lost the Rhode Island governorship to an independent, Lincoln Chafee. That’s a net gain of seven, and a pick-up of some of the most crucial states as both parties gear up for the 2012 presidential election. Electoral vote-rich states such as Pennsylvania, Ohio and Michigan will play an enormous role in helping select the next president. In the same category is Florida where a hard-fought battle for Republicans to hang on to the governorship proved successful on Wednesday when Democrat Alex Sink conceded defeat to Republican Rick Scott. And Iowa, with its first-in-the-nation caucuses, will have outsized influence over the nominee chosen by each political party. Equally critical are the coming moves in almost every state to redraw the lines for congressional and state legislative districts, according to the results of the 2010 census. Those decisions – required every 10 years, and overseen by governors and state legislators – can make a difference in giving one political party a leg up over the other, in the way district maps are drawn. Subtle boundary changes can result in districts more favorable to Republicans or Democrats, depending on who is in the room when decisions are made. You’ve seen some of the results over the years, in districts that stretch from one end of a state to another, or wrap around a city like a pretzel. Republicans will have more influence in this process because of the success they had Tuesday in turning over state legislative bodies in their favor. The party in control of the White House almost always loses legislative seats in midterm elections, and this week was no exception. According to the bipartisan National Conference of State Legislatures, Republicans picked up at least 680* seats, giving them the majority in states including Pennsylvania, Ohio, Michigan, Iowa, Minnesota and North Carolina. There are several more state chambers still undecided, including the New York Senate. 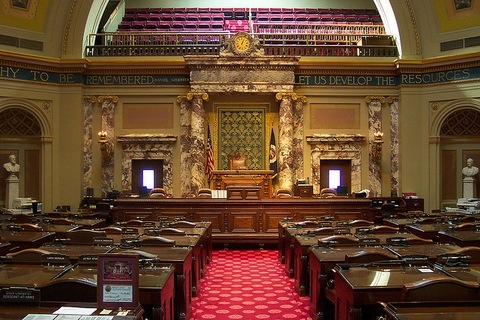 As of this writing, Republicans will control at least 54 of 99 state legislative chambers and 53 percent of the overall state legislative seats – the most for the GOP since 1928. With tightened federal budgets, and an increasing emphasis on the importance of lawmaking at the state level, on issues like taxation, education and immigration, this week’s political shifts have real consequences. Finally, it’s worth noting that of the 12 most populous states in the country – where almost 60 percent of the American people live – at least 8 are now to be led by Republican governors. (Illinois is still undecided and may be headed for a recount.) That’s serious GOP clout. This figure was raised on Nov. 4 from the original figure of 500, according to new information from NCSL.